Thanks Nicol!!! Wow! Just when I think that it's finally over, my birthday celebration continues! I just received a fabulous package from Vegas from my friend, Nicol. I love presents! I also feel incredibly spoiled! She's picked lots of fabulous purple yarns for me in absolutely incredible shades. First, there's "Nature's Palette" (100% Merino) in the "Orchid" color way...the color is very deep and rich and the yarn is very soft. 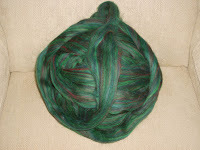 Next is "Fabulously Zen Yarn" (50% Merino/50% Tencel) in the "Tea Cups" color way - hand painted. It's got varying shades of purple, some ecru, and a touch of mauve....it's a delight to look at and feel. There's also "Sea Wool" in the "Glacier" color way from the Fleece Artist (30% sea cell/70% Merino) - it's so soft! It feels like a cloud.....and it's machine washable too! The colors are gorgeous and you've got to love the name of the pattern that's on the ball band, "Sea Wool Bordello Socks"! 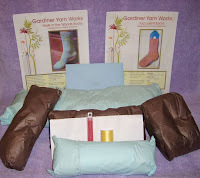 Plus, she also included two sock patterns from Gardiner Yarn Works. And as if that's not enough, she's even included some fabulous hand-dyed wool in purple, pink, and grey - it's luscious! I believe she dyed this herself - in my favorite colors too! The colors are very vibrant and I just love it! There's some hand-dyed BFL in a gorgeous variety of colors - I can't wait to start spinning it! (She knows that I love BFL....and I'm sure she dyed this herself, which makes it extra special!) And, to help me expand my spinning skills, she's included instructions, beads, and thread for spinning with beads! Mohair - I forgot to include this on Saturday's post. Elizabeth also gave me several skeins of mohair blend (pink/mauve) and some tiny off-white mohair loop. She's allergic to mohair and since I like mohair and am not bothered by it, I've become the lucky recipient of even more mohair! Thanks Elizabeth! Butterflies - I did find out what type of butterfly we saw on Saturday when we were surrounded by hundreds of the beauties while on our "yarny road trip" - it's the "Tiger Swallowtail Butterfly"....imagine that! 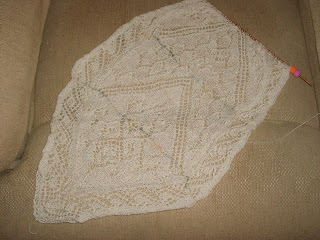 Here I've made the "Swallowtail Shawl" and didn't recognize the "real thing"! It's also the official Virginia State Insect! Knitting Progress and the "Little Tomato Plants That Could"
A fabulous end to a fabulous weekend! A couple of my friends, Pamela and Jill, and I met up at a local restaurant and spent the entire afternoon on Sunday knitting, chatting, and of course, eating and sipping coffee. I definitely needed some "mindless knitting" so I could concentrate on the conversation, so I decided to start my "Cascading Fuchsia's" felted Noni bag - it's a stockinette stitch base, and then 60 rows of stockinette for the body of the bag - the perfect project so it won't interfere with the chatting! Although we hung out for about 7 hours, I only managed to finish the base and about 20 rows of the body - I was too busy chatting and ogling the other fabulous projects! I feel like such a lazy bum as both of my friends are making jackets....lots and lots of knitting! Pamela is making the fabulous circular coat out of Berroco Foliage from the Berroco Foliage Pattern book 247. It's absolutely gorgeous - lots of rich blue/turquoise and purples. She's completed the entire border - 620 rows!!! 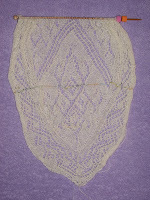 She's also picked up all the stitches along the edge to start working toward the center of the circle. I can't wait to see it when it's finished - it will be BEAUTIFUL! Jill is making a gorgeous jacket in grey moss stitch with lush black edging and button bands. She is almost finished! 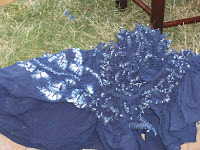 The main knitting is done.....all that's left is the crocheting of the button bands and then sewing the sleeves. It will be a very elegant and stylish jacket when she's done. We had a wonderful time! I wish every weekend was just like this past weekend! I did manage to complete 10 rows of Mystery Stole 3 last Friday, but I haven't touched it since! And since this week is a very busy week for me, I doubt I'll get any more completed. 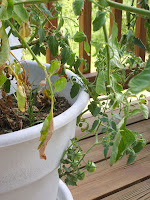 Here's an update on my tomato plants that had been bludgeoned by hail early in June. It's 1 1/2 months later, and they're doing great! 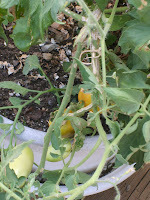 I have tons of tomatoes from the 4 plants...although, some of the tomatoes bear "hail scars". Two of the plants STILL show extreme hail damage....but they're hanging in there and bearing wonderful fruit. This plant has a branch that's barely hanging on....for all practical purposes, the branch is broken. BUT....it's STILL nourishing the extremities....in spite of the damage, and there are healthy tomatoes growing there in spite of it all (as shown in the photograph on the right - click to enlarge). In the photo on the left, you can really see the branch - and how it is almost severed but is still "hanging on"! 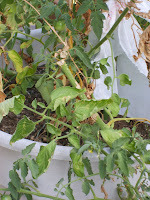 This plant shows severe battering, but as you can see, there are plenty of tomatoes in varying stages of ripening on these branches as well. 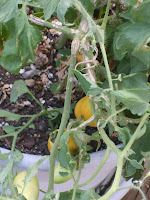 I just picked a large Roma tomato from the "bundle of tomatoes" on the branch shown - it was GREAT in our salad with dinner! I'm still having a bit of a time with "blossom end rot" on the Romas.....I've added several crumbled egg shells, and the problem has improved, but I'm still losing half of them! A Day Trip of Knitting Adventures! I have had the most marvelous day! I spent the day with traveling to various yarn shops, fiber shops and a craft store with my friend Elizabeth. It was a very full day and I'm absolutely exhausted....but definitely, in a good way! the weather was absolutely perfect - sunny and gorgeous - no humidity!!! 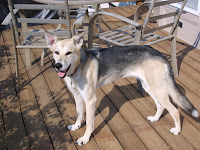 I met Elizabeth's fabulous dog, Whipper, and of course, have the "cute animal" photo that goes along with it. 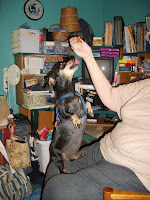 Whipper is such a sweetie and definitely enjoys being in the "limelight"! We started out in Gordonsville at Limerick Fibres. We arrived a bit early, so while we were waiting, I opened a fabulous "treasure pack" of birthday goodies (I just love it when you can extend birthday celebrations over a matter of weeks!). 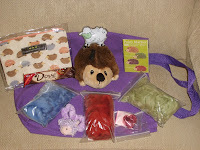 I could not believe all the cool hedge hog items she found for me! The hedge hog "Point Markers" will be invaluable for holding the "cover sheet" in place for "marking" my place in my MS3 Stole chart! There's some fabulous "sheepie" mint scented bath gel, a tiny heart shaped hand lotion, a lambie scrunchie for my hair, and of course, the required sustenance....a yummy Dove bar. All of which was packed into the purple tote bag the goodies are resting on. Oh...she also visited a place call "The Black Lamb" and gave me some sample fibers from there - and they're not "small" samples - they're about .7 oz. each! 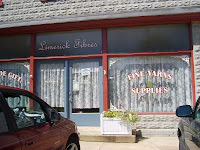 Limerick Fibres is a wonderful shop right down town in a quaint little town - I love the lacy curtains that hang in their window! They have not only yarns, but also some fibers, felting fibers, some small looms, baskets, rug hooking supplies (wool, frames, latch hooks, etc), and lots of other fabulous things that I've forgotten to mention. They also have multiple styles of the gorgeous Lantern Moon baskets that we all love!. Additionally, they have some gift items as well - knitting/spinning related plaques, 3D art works, and greeting cards. Of course, several patterns and some yarn "found" it's way into my bag. It was definitely worth the trip! Next, we were off to Stony Mountain Fibers. The trip there was quite interesting. We turned off the main road onto "Turkey Sag Road" (gotta love the wild names that abound in central Virginia!). The drive was gorgeous - the scenery was astounding - fields, rolling hills, mountains in the background. Wow! We drove quite a ways down the road and then it suddenly becomes a gravel road....and narrows considerably. We drove through groves of trees....up and down hills...all the while, the road was constantly changing. It got narrower and wider, bumpier and smoother, and it even went from paved to gravel and back to paved again! Suddenly, there's a meadow off to our right with some weeds with purple topped flowers (perhaps clover?) and we were surrounded by the hundreds of gorgeous butterflies that made these flowers their home! They were similar to the Monarchs, but were more of a yellow and black - oh were they beautiful! It was definitely an unexpected treat! Shortly after turning left on Rt. 20 looking for Hammocks Gap (where Stony Mountain Fibers is located), we passed by Pinch Em Slyly Place (yet another "odd" road name - it's even listed in a website of unusual street names - Bewildering Boulevards). We finally found Hammocks Gap and arrived at Stony Mountain Fibers. I have visited Barbara (the owner) at the various fiber festivals (and of course, made several fibery purchases! ), but I've never physically been to her shop. 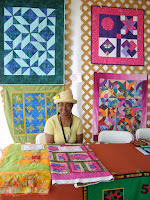 I was amazed at everything she had - yarn, books, dye, fiber (all kinds! 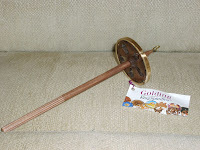 ), looms galore, spinning wheels galore, and every type of spinning/knitting/crocheting tool and supply you can imagine. Of course, I lusted over the Strauch carders once again. I will get one....eventually! Oh, my....I found several interesting things that I just "had" to get! Including two very interesting new felting books that Barbara just got in! They have fabulous projects in both of the books...and being a bibliophile, I just couldn't resist: "Knit It Felt It" edited by Bobbie Matela and "Needle Felting by Hand or Machine" by Linda Turner Griepentrog and Pauline Wilde Richards. My favorite purchase today had to be the 1 1/2 lbs. of Cormo roving that's from Barbara's own sheep - she has 16 Cormo sheep. I just love "knowing" the sheep that I'm getting my fleece from - it makes it extra special! 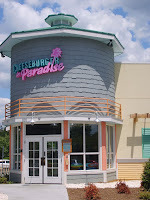 Next, it was off to "Cheeseburger in Paradise" for a late lunch. I had a fabulous Cheddar Bacon Burger - and they had LIVE music - yes, live music on a Saturday afternoon! The musician was fabulous! He did such a good version of "Wasting Away in Margaritaville" that we thought it was a tape....until we heard people clapping! (I brought DH a couple of coasters, with our waiter's blessing, to commemorate the visit since he's such a Jimmy Buffet fan!) 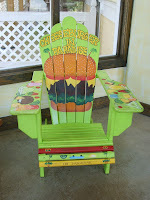 Here's an interesting fact - the restaurant chain was started in 2002 by Outback Steakhouse and Jimmy Buffet himself! Pretty cool, eh? After re-energizing, we then visited "It's a Stitch" - a yarn shop I'd been to a few years ago when we went on a mini-vacation and toured around Charlottesville and Jefferson's home at Monticello - the yarn shop was literally in a shopping center right next to our hotel - much to DH's "horror! I must confess, too, that this is the shop where I purchased the Rowan Linen Drape yarn to make a Kim Hargreave's shell.....yes, the infamous "almost finished" shell that I've mentioned a few times - the back is done and so is most of the front - I just have the right side of the V neck to do (the left is done) and then the dreaded finishing - sewing it together and adding the crab stitch edging! At "It's a Stitch", I managed to pick up a few patterns and tons of discounted yarn - they were having a fabulous sale on many of the yarns. Oh, my, the variety of yarns they carry! Whew! Also, while I was there, I happened to meet another person from my town! I'm 2 1/2 hrs. from home in a yarn shop....and yet, I met someone from "home" - what a small world! What are the odds? Needless to say, we've exchanged phone numbers and hope to get together and knit sometime soon! The final stop was at Michael's Craft Store. It's not that I don't have a Michaels up here by me, but I've never been to one that had an "entry" on the first floor, but the actual shop was on the second floor! It was a bit unusual, so we just had to go there! It's quite a large shop with a bit more variety than my local one. I picked up several crating "necessities"....honest....they ARE "necessities"! Mystery Stole 3 - Clue 3 Finished with 2 Days to Spare! Just a quick post as an update on my Mystery Stole 3 progress. I finished Clue 3 this evening! Finally....I'm ready for the next clue ahead of time instead of "after the fact"! Now I have to get busy doing the things I've let slide....just so I could finish Clue 3! Thanks So Much to My Fabulous SP10 Angel! Wow! I got home tonight to find a wonderful package from my SP10 Angel - Debra from Georgia! My Secret Pal had to drop out and my fabulous hostess got right on it and found the perfect angel for me! Many thanks to both of you! Where to begin....there are so many wonderful things! I love the cute little cup and saucer.....I'm going to put my beads in it as I knit the Mystery Stole 3 - it's sooooo much cuter than the plastic lid that I'm currently using for my working beads! The bookmark is just perfect - it's an antique looking bookmark with a nostalgic picture in it and pinkish/purple rhinestones around the frame. I love it! I've got some fabulous Vanilla scented items as well - a couple of sachets and a yummy candle. Why is vanilla such an infectious scent? It's such a calming smell. I have some cute note cards and some decorative pads of paper for keeping track of stitch counts and shopping lists....at least that's what I plan to use them for. 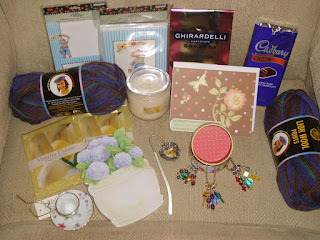 There was some wonderful chocolate as well - a staple in every knitter's "tool box" - LOL! And of course, the yarn - it's a variegated wool in shades of blue, green, and brown in the "Majestic Mountain" colorway. The ball band has a pattern for a hat, but I think I'll make either a bag or a pair of felted mittens. I have a pattern for felted mittens that I've been dying to make....and I think this yarn will work perfectly! I may even add some Fun Fur to the edges for an added design element. Hmmm.....this is yet another project to add to my ever increasing list of PIWs! AND.....there was also a cute little round box....and inside were 3 sets, yes SETS, of stitch markers....each set sized different needle range. The first set is perfect for lace/sock knitting needles, the second for the typical DK/worsted needles, and the third for Aran and bulkier yarn needles. Wow! Thanks again for the wonderful package! MS3 Status Now, on to Mystery Stole 3 progress and other "knitty" news. I completed row 170 last evening which puts me at 40% complete with Clue 3! I'm not sure if I'll be able to work on MS3 tonight or not....it depends on how many other distractions come my way! My goal is to completed Clue 3 BEFORE Clue 4 comes out on Friday, and at this point, I think it's a definite possibility! 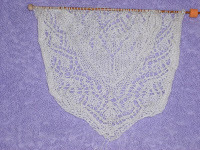 Ravelry I've also been having a blast poking around and posting on Ravelry. I just love it! It's a fantastic way to keep track of you projects, stash, books, planned projects, etc. And, it's the perfect place to get inspired by the fabulous creations of others! The creators of Ravelry have done a fabulous job! Mystery Stole 3 - Finished Clue 2!!! Wahoo! I finished clue 2, so now I'm not too far behind sinceClue 3 just came out this morning. Hopefully, I'll get started on it this weekend. I'm not planning to block my stole until I take it "off the needles", so my photo of the progress is not as stunning as the pictures others have posted. However, I think you can see the basic progress and stitches....as well as my "lovely" lifeline. So far, my only disappointment has been with the beads. I wish they showed up better - hopefully they will once it's blocked. I didn't want beads that contrasted and I didn't want the "pearl" beads as they'd look dirty against the white Zephyr. I guess I should have included beads in my swatch so I could see how well they showed up. On the other hand, since the theme of the stole is a mystery, perhaps the subtleness of the beads will enhance the completed design. I also have some very "enabling" friends...one of whom mentioned that they were about to place an order from Astrid's Dutch Obsessions! So, now I have a bunch of sock yarn and another skein of Kauni on its way! This time, I'm getting the darker Kauni - purple, grey, and black. Most of the sock yarn is Fabel - I wasn't sure about it when I saw it, but now that I've seen how it works up, I love it! Check out out the socks here under the July 11th post. AND I had to get a skein of Regia Galaxy - which is really cool looking as well as a couple of skeins of Trekking Pro Natura! The Mystery Stole is really coming along. I completed row 118 on Monday night, but haven't had a chance to do any more. That puts me at just under 40% of Clue 2 complete - wahoo! I can't wait for the next clue....I really like how this is turning out. Although I haven't blocked mine, I've been admiring the results of those who have, and the blocked results are just stunning! 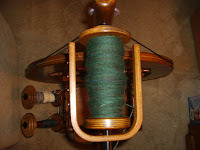 Last night at our spinning get together, I spun some more of the gorgeous deep green wool top I'd purchased a few months ago. The multicolored fibers give depth to the overall forest green color way. I'm really pleased with how this is turning out. The fiber was an absolute bargain at just $10.40 per lb.! I dearly love bargains....it helps make up for purchases like "Gaywool Merino-Silk 85/15" from Australia at $32.00 for 8 oz.! 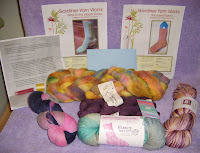 I also had the chance to purchase some of Colleen's fabulous mohair blends from her own goats! I just love the idea of having roving from "named and loved" animals (be sure to check out the pictures of her Angoras on her website!). I got 8 oz. of each of the two mohair blends - Mohair/Jacob and Mohair/Longwool. Both are very lustrous and soft. Of course, I have NO idea what I'll make, I'll leave that decision for another day. I'm trying to decide if I should go down a needle size or not on my Lilith. 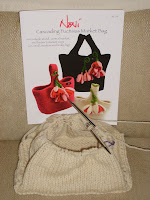 It's a bit too open - especially since I'm a loose knitter. 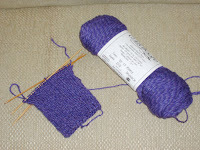 I'm toying with the idea of switching to size 8 needles for a while to see if I like it better on the smaller needles. After a few inches (2-3), I'll then compare the "look" to see which I prefer. Hmmm.....what a dilemma! Here's the yummy 8.4 oz. 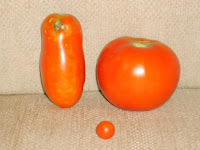 tomato.....and it's "cousins" before I cut it up for a sandwich. We've already had a couple of tomatoes, but they've been Romas and Health Kicks...and a couple of lonely cherry tomatoes....quite a different flavor from the plump Mountain Fresh tomato! I was a bit slow starting on Mystery Stole 3, but now, I've made some progress. 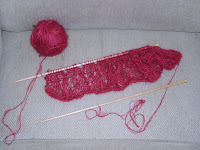 I finally cast-on yesterday and I've completed 90 of the 100 rows for Clue 1. Hopefully, by the end of the weekend, I'll have completed Clue 1 and started on Clue 2. I really like how it looks and now I'm very excited about completing it! In effort to keep my sanity, especially if I have to "frog" any rows, I'm also working on the Louet Lilith in addition to my Wildfoote socks. These should provide some much needed "rest" from the stole should I become frustrated. The Lilith has a very soothing eyelet pattern....and the socks are definitely in the realm of "mindless knitting" as I'm using the "Hellen's Favorite Socks" pattern 3x1 rib once again. There's something comforting about having "back-up" projects! As you can see, the Lilith is barely started, but I anticipate completion by the end of the summer! On a more "domestic" note......The old Hoover has been giving us a bit of a problem and we've had to replace the drive belt a number of times (It has NOTHING to do with long hair getting tangled around the beater bar and stressing the belt....honest!). Anyhow, the new bag less version started looking very appealing as it's currently the "shedding" season for my dog and every time we vacuum, we easily fill a bag! The bags have been getting harder and harder to find....plus, they've become a bit pricey. That coupled with the sheer volume of fur that is "discharged" from "The Guardian of the Wool" (pictured on left)on a daily basis, makes vacuuming a rather expensive chore. The quest began for a new vacuum. A local shop had a very nice price on the bag less Hoover....PLUS a $40.00 coupon! Wahoo! 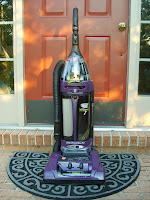 DH and I went out in pursuit of the new Hoover yesterday, and voila....we got it! AND......joy of joys.....guess what color it is? PURPLE!!!! How cool is that? I am just thrilled....it makes me want to vacuum! Not really.....I was just getting carried away by the thought of a purple vacuum! 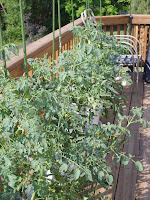 Oh, one other piece of good news....my tomato plants appear to have done a full recovery from the hail! Only some scarring on some of the tomatoes provide any hint of the icy barrage! 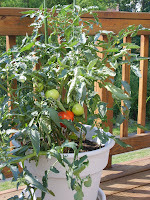 Check out the big tomato on the "Mountain Girl" tomato plant! There Was No Joy in Mudville.....the Mighty Cubbies Had Struck Out! One thing that you need to know.....Cubs fans are a very rare breed. We are long suffering and VERY patient! It's been forever since we've won the series, but hope DOES spring eternal. 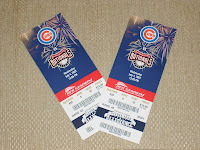 But, as a true and dedicated fan, I still thoroughly enjoyed the game and still remain loyal to my Cubs. Besides, this was a fantastic way to celebrate the 4th of July. DH went to the game with me too....even though he's really not into baseball at all! What a sweetheart! The metro to the game was full of Cubs fans - what a delight to see! 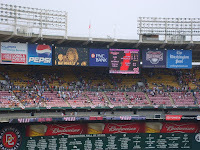 At an earlier game this week, they said there were more Cubs fans than Nationals fans! 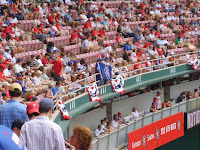 There were LOTS of Cubs fans at the game as well. 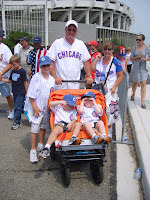 On the way out of RFK Stadium, I spotted a family of Cubs fans and just had to snap their picture. As it turns out, they're visiting DC from Illinois! It turns out we were born in the same town! AND.....I know her uncle and she knows some of my relatives as well. What a small world this is! In spite of today's loss, I had a fabulous time at the game. The weather was perfect - not too hot....not too humid....and my DH was there with me! Hot dogs and Cracker Jacks and Boardwalk Fries - mmmmmm! As an added touch of perfection, I got home before the severe thunderstorms and tornado warnings that caused the National Mall to be evacuated! There may be no joy in Mudville, and my Cubbies may have gone down in a fiery loss, but all-in-all, I have to rate the day a win! American Folklife Festival, Knitting Progress, and the Cubs! 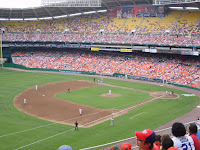 Summers are very busy in the Washington, DC area - there are so many things to do! The past couple of days have been unseasonable mild as well - which means I've been spending more time outdoors than indoors knitting! The first quilt is the Remembrance quilt from the 9/11 attacks - it was very moving and is a stunning work of art. 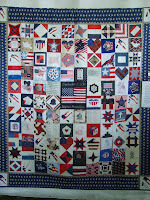 There were also a number of other quilts on display. All of quilts shown here were part of the Virginia display. 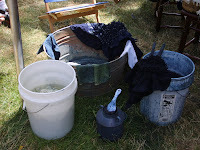 The most fascinating display was that of indigo dying. Elaborate patterns of butterflies and flowers are made by tying threads threads around the fabric and then immersing it in the dye pot. The pictures above show fabrics in process. The first photo is a bit dark, but I think you can make out the "bunched up" area - that's where the fabric was tied in little bundles. In the second photo above, you can really see the detail of the tied areas of the fabric. 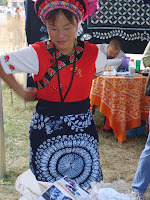 Here, the participant has tied the fabric around her waist as an apron. The color contrast is absolutely stunning. She also scooped out some indigo from the bottom of the pot on a spoon so we could smell it. I was surprised - it has a very pleasant odor - almost "tea like". This completed cloth is absolutely stunning. Check out the minute details in the leaves, flowers, and butterflies. 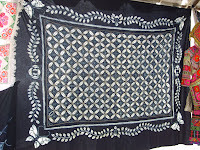 It's hard to believe that this entire work of art was created using white fabric, indigo dye, and thread! There were a number fabulous looms and examples of silk weaving in the Mekong exhibit as well. The photo album I mentioned above has numerous pictures of these. 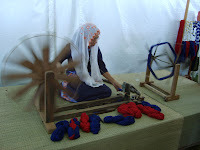 Here, I've captured an "action shot" where the participant is loading the silk onto the bobbin in preparation for weaving. The Northern Ireland exhibit included a large display of gorgeous linen. 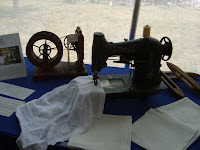 The "beetling" machine shown here with the sewing machine was fascinating. Unfortunately, the picture is rather dark - a consequence of the festival being outdoors and the sun shining in the wrong direction through the tents. (I'm not sure how to spell "beetling", so if anyone does, please let me know!) The machine has a number of wooden posts that jump up and down on the fabric as the crank is turned - this process was to bring out the sheen of the linen. The exhibitor said that they soon found that they could wrap it tightly around a large drum like contraption and it would have the same effect in a more efficient manor. The final pictures are from the Irish rug making display. 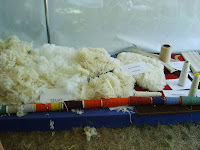 The first photo shows the various components that go into making the rug - fiber and yarns that are put through a jute backing. 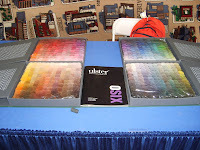 The boxes on the table show a sampling of the many and varied colors available for making the rugs. In the background, you can see part of a very elaborate rug depicting streets. It's so detailed, it almost looks like a painting. I have a better picture of the rug in the photo album, but I could not fit the entire rug in the picture as the booth was a bit "tight". I finished the day at Mia's where her mother had prepared and absolutely fabulous feast of American and Filipino food. Her mother is a fabulous cook - everything was wonderful! After dinner, Mia and I got out our knitting and worked on our projects for a while - she worked on her green felted bag and I continued to work on my purple Wildfoote sock. 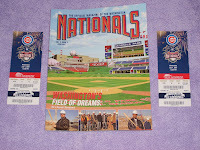 Then, today at work, I found out that I'd won two tickets to see the Cubs play the Nationals at RFK Stadium in Washington, DC on July 4th! What an exciting way to spend "Independence Day"! As a long-suffering Cubs fan, this was a fabulous surprise! I can't wait! "Take me out the ball game......Take me out to the crowds......"
My birthday was great! I got lots of fabulous fiber related goodies.....in addition the the wonderful package I'd received earlier this week from Mia! "Birthday Eve", I went to Uniquities to take part in a "birthday discount" shopping spree. Brenda, the owner, gives the birthday boy/girl a generous discount equal to 1/2 of their age! Needless to say, I found lots of wonderful books, yarns, and notions that just "had" to go home with me. 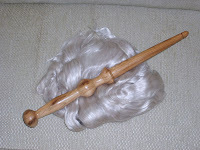 I even purchased several small lots of silk and silk blends to spin - my friend Ce couldn't believe that I hadn't spun silk, so between the silk hankies she sent me and the fiber I bought on Friday, I think I'm set to "try" my hand at spinning silk. 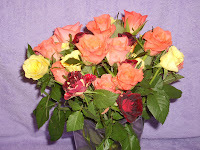 These lovely flowers showed up as a surprise at work on Friday from my Hubby. This brings me to Saturday, my birthday. 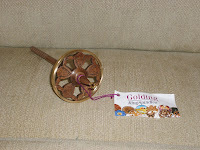 My mom and dad bought me a gorgeous Golding spindle (two views above)which I'll be using to spin the silk I purchased at Uniquities. And, when I'm done spinning, I'll use the gorgeous hickory Nostepinde (on the right)that Lisa gave me to make a center pull ball - what fabulous gifts! There's even more! I got several fabulous and thoughtful gifts from my daughter. I got chocolates (imagine that), a Durham Bulls T-shirt and a mini Durham Bulls batting helmet. We used to go to the Durham Bulls games together on weekends when she was growing up....and I got to play a baseball fan on screen as an extra in the movie, "Bull Durham". As far as "enabling" my knitting/spinning addiction, she didn't "directly" enable. Instead, she's providing indirect "support" with a beautiful multi-colored blue yoga mat (I go to yoga class a couple of time per week - it helps keep my knitting/spinning muscles and joints in prime condition!!!). The final gift was a very nice set of cut glass martini glasses - for those days when a Cosmo or Chocolatini is an absolute necessity - for example, when you have to "frog" multiple rows of of an intricate lace pattern or take part in other equally catastrophic knitting "events"! I ended the celebration with a wonderful Filet at JR's Steakhouse followed by an evening of fabulous entertainment at Wolf Trap. We listened to the folk singing of "The Kingston Trio" and were entertained by the fabulous humor and music provided by "http://www.smothersbrothers.com/". Definitely a fabulous way to end my birthday celebration!